Broadway House, Ludgate Hill, E.C. Punctuation and spacing must match entries exactly (e.g., Ballot-box or Law giver). Uppercase AND, OR, and NOT serve as Boolean operators. The Keyword field searches for strings. Entering Peaceful, for example, finds Peacefully and Peacefulness as well, but realize that entering urn will retrieve Burn, Furniture, and so forth. To anchor a match at the beginning of an entry a caret must precede the word (e.g., ^urn finds only Urn). To find a word anywhere in an entry surround the word with the @ sign (e.g., @urn@ finds Cinerary urn as well as Urn). The Page field is an exact match search. 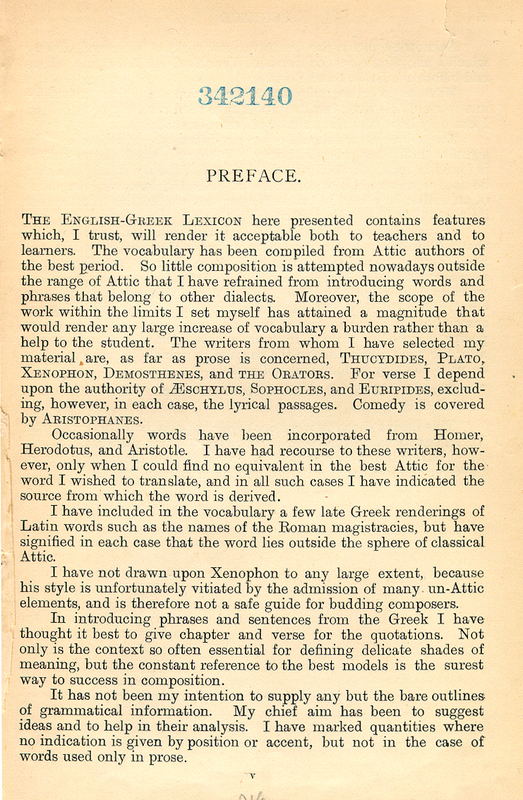 (Page Image) The ENGLISH-GREEK LEXICON here presented contains features which, I trust, will render it acceptable both to teachers and to learners. 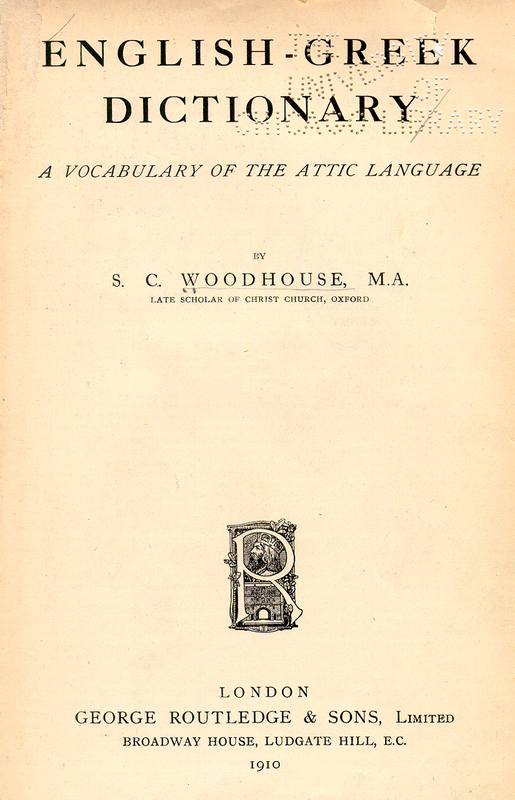 The vocabulary has been compiled from Attic authors of the best period. So little composition is attempted nowadays outside the range of Attic that I have refrained from introducing words and phrases that belong to other dialects. Moreover, the scope of the work within the limits I set myself has attained a magnitude that would render any large increase of vocabulary a burden rather than a help to the student. The writers from whom I have selected my material are, as far as prose is concerned, THUCYDIDES, PLATO, XENOPHON, DEMOSTHENES, and the ORATORS. For verse I depend upon the authority of AESCHYLUS, SOPHOCLES, and EURIPIDES, excluding, however, in each case, the lyrical passages. Comedy is covered by ARISTOPHANES. Occasionally words have been incorporated from Homer, Herodotus, and Aristotle. I have had recourse to these writers, however, only when I could find no equivalent in the best Attic for the word I wished to translate, and in all such cases I have indicated the source from which the word is derived. 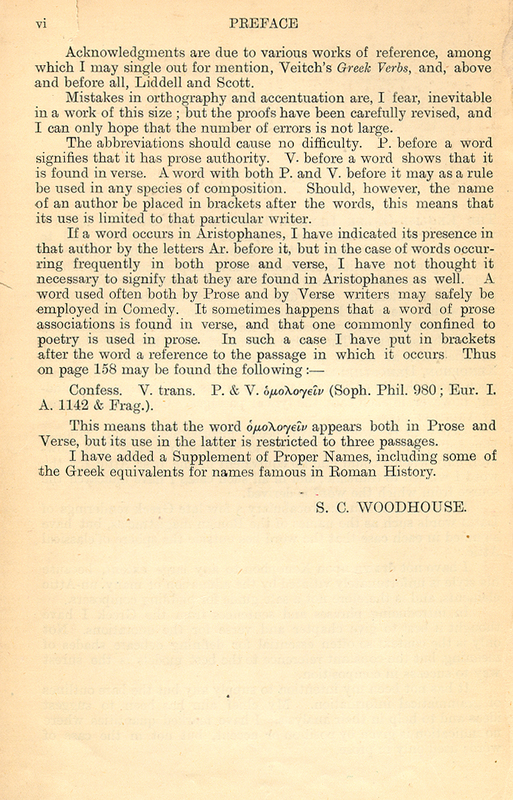 I have included in the vocabulary a few late Greek renderings of Latin words such as the names of the Roman magistracies, but have signified in each case that the word lies outside the sphere of classical Attic. I have not drawn upon Xenophon to any large extent, because his style is unfortunately vitiated by the admission of many un-Attic elements, and is therefore not a safe guide for budding composers. In introducing phrases and sentences from the Greek I have thought it best to give chapter and verse for the quotations. Not only is the context so often essential for defining shades of meaning, but the constant reference to the best models is the surest way to success in composition. It has not been my intention to supply any but the bare outlines of grammatical information. My chief aim has been to suggest ideas and to help in their analysis. I have marked quantities where no indication is given by position or accent, but not in the case of words used only in prose. (Page Image) Acknowledgments are due to various works of reference, among which I may single out for mention, Veitch's Greek Verbs, and , above and before all, Liddell and Scott. Mistakes in orthography and accentuation are, I fear, inevitable in a work this size; but the proofs have been carefully revised, and I can only hope that the number of errors is not large. 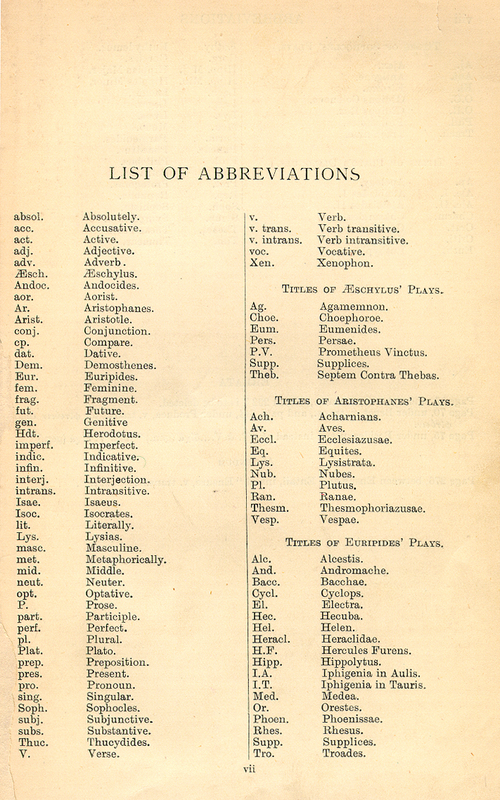 The abbreviations should cause no difficulty. P. before a word signifies that it has prose authority. V. before a word shows that it is found in verse. A word with both P. and V. before it may as a rule be used in any species of composition. Should, however, the name of an author be placed in brackets after the words, this means that its use is limited to that particular writer. Confess. V. trans. 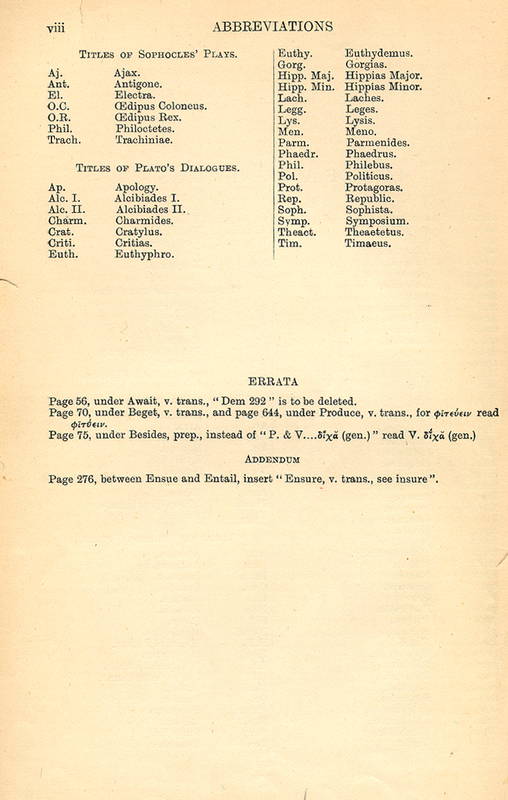 P. & V. [Greek omitted] (Soph. Phil. 980; Eur. I.A. 1142 & Frag.). This means that the word [Greek omitted] appears both in Prose and Verse, but its use in the latter is restricted to three passages. I have added a Supplement of Proper Names, including some of the Greek equivalents for names famous in Roman History.